West Brom earned their first home league win against Manchester United for 32 years as Salomon Rondon's low strike beat the 10-man visitors. United played for more than an hour without Juan Mata, who received two bookings inside three minutes. But Albion created little until Rondon found space to fire in substitute Sebastien Pocognoli's dangerous first-time cross from the left wing. United rarely looked like equalising as they lost ground on the top four. The Red Devils are sixth in the Premier League table, failing to move back above West Ham and remaining three points adrift of fourth-placed Manchester City. Victory moved Albion up to 11th, their tally of 39 points almost certainly securing top-flight survival for a sixth successive season. Manchester United looked assured in the opening 25 minutes as they dominated possession against the Baggies, albeit without really troubling home keeper Ben Foster. But the entire complexion of the match turned on the stupidity of the normally-intelligent Mata. The Spain international was shown his first yellow card for rashly blocking Darren Fletcher's quick free-kick, then he was given a second when he needlessly clipped the heels of the former United midfielder within three minutes. 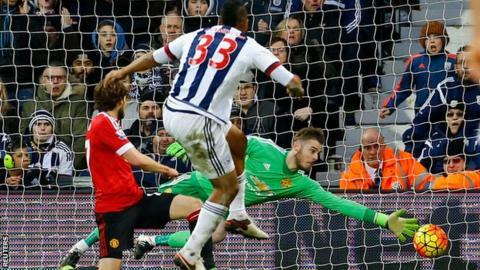 Within seconds of Mata's dismissal, Albion almost took the lead when Craig Dawson's ambitious 25-yard punt looped over David De Gea but dropped just past the wrong side of the left-hand post. An Albion onslaught failed to materialise in a dour end to the first half, while United almost opened the scoring through Marcus Rashford's instinctive drilled shot and Jesse Lingard's dipping angled drive before the hour mark. But the home side gradually grew in stature as United tired, finding the breakthrough through Rondon's smart finish. "I thought we looked flat when they went to 10 men but the advantage of 11 v 10 seemed to get us through in the end," said Scotland midfielder Fletcher afterwards. Many Albion supporters have not warmed to Tony Pulis since his arrival in January 2015, complaining about the style of football the ex-Stoke manager has brought to The Hawthorns. But what they cannot dispute is the fact the Welshman has steered them away from a relegation scrap for the second successive season. Pulis faced heavy criticism last month after a dire 1-0 defeat at Newcastle left them six points above the drop-zone and without a win in five games. However, their fortunes have dramatically improved and they have now taken 10 points - three wins and a draw - from their past four matches. In addition to almost securing survival, Pulis has also achieved something that no Albion manager has since March 1984 - a home win against the Red Devils. Once the home side went ahead - with their only on-target shot of the second half - they did not look like relinquishing their slender lead. United switched to a 4-4-1 formation after Mata's dismissal, leaving French youngster Martial as an isolated lone striker. Despite a brief spell where United threatened through Martial and Lingard, the visitors failed to force Albion keeper Foster into a single save. West Brom manager Tony Pulis: "Them going down to 10 men affected the game. We watched Liverpool go down to 10 before this game and they won 2-1. You're never comfortable against top teams with pace up front and they have pace. Once we got the goal we kind of settled down. "Second half we were definitely off the pace a bit but the goal was a smashing finish [by Rondon]. It has taken him time to settle in and he has had ups and downs but they love him to death here. "At the start of the season before the nonsense with Saido I was looking forward to them playing together. Since Saido has come back in the two of them have looked really lively together and we look a threat. "The most important thing is the next game - as you've seen this year, results have been off the radar. Let's get 40 points, I think that's definitely enough to be safe." All 10 of West Brom's Premier League wins this season have been by a one-goal margin. Mata picked up two yellow cards just 26 minutes from the kick-off, faster than any player in the Premier League since Swansea defender Chico was sent off for two bookings in April 2014. The Baggies are back in Premier League action on Saturday, travelling to title-chasing Arsenal knowing that a win could move them into the top half. Meanwhile, Manchester United's attention switches to the Europa League and the away leg of their last-16 tie against Liverpool. Their next league game is a trip to neighbours City on Sunday, 20 March. Match ends, West Bromwich Albion 1, Manchester United 0. Second Half ends, West Bromwich Albion 1, Manchester United 0. Attempt missed. Timothy Fosu-Mensah (Manchester United) right footed shot from outside the box misses to the right. Offside, Manchester United. Marcos Rojo tries a through ball, but Anthony Martial is caught offside. Offside, West Bromwich Albion. Darren Fletcher tries a through ball, but Craig Gardner is caught offside. Substitution, West Bromwich Albion. Sandro replaces Saido Berahino. Offside, West Bromwich Albion. Salomón Rondón tries a through ball, but Craig Gardner is caught offside. Substitution, Manchester United. Timothy Fosu-Mensah replaces Matteo Darmian. Offside, West Bromwich Albion. Sébastien Pocognoli tries a through ball, but Salomón Rondón is caught offside. Substitution, West Bromwich Albion. James McClean replaces Stéphane Sessegnon. Goal! West Bromwich Albion 1, Manchester United 0. Salomón Rondón (West Bromwich Albion) left footed shot from the centre of the box to the bottom right corner. Assisted by Sébastien Pocognoli with a cross. Attempt missed. Saido Berahino (West Bromwich Albion) right footed shot from the centre of the box is close, but misses to the left. Assisted by Sébastien Pocognoli with a cross. Attempt blocked. Jesse Lingard (Manchester United) right footed shot from the left side of the box is blocked. Assisted by Anthony Martial. Attempt blocked. Stéphane Sessegnon (West Bromwich Albion) right footed shot from outside the box is blocked. Assisted by Salomón Rondón. Substitution, West Bromwich Albion. Sébastien Pocognoli replaces Craig Dawson because of an injury. Attempt missed. Jesse Lingard (Manchester United) right footed shot from outside the box is just a bit too high. Assisted by Marcos Rojo. Corner, Manchester United. Conceded by Craig Gardner. Corner, Manchester United. Conceded by Salomón Rondón. Corner, Manchester United. Conceded by Jonas Olsson. Attempt blocked. Marcus Rashford (Manchester United) left footed shot from the centre of the box is blocked. Second Half begins West Bromwich Albion 0, Manchester United 0. First Half ends, West Bromwich Albion 0, Manchester United 0.